Matt Perman’s excellent book takes the topic of productivity and turns it on its head, challenging us to ask the right questions about what we do. 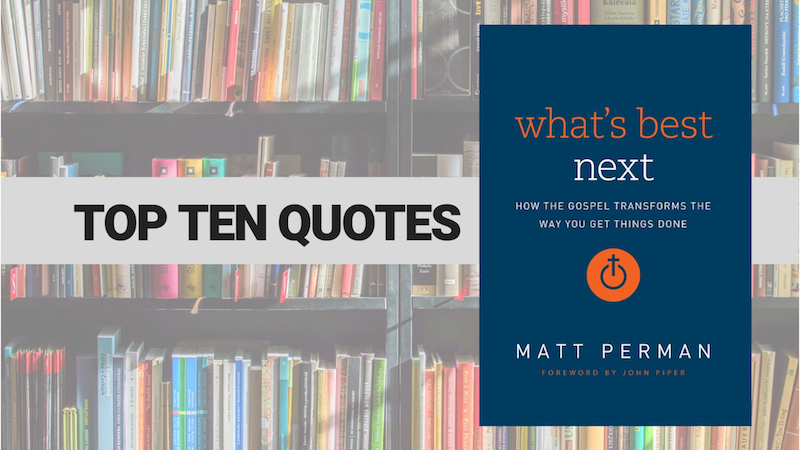 What’s Best Next: How the Gospel Transforms the Way You Get Things Done was full of both great practical resources and soul-searching challenges. I have already implemented a little of both since wrapping it up a few days ago. We weren’t made to simply respond to stuff all day, but to take action and move things forward. …efficiency exists so that you can serve others better, not sacrifice them to efficiency. …the curse of the fall didn’t only affect manual work, as we often seem to think. The curse also affected knowledge work. Excessive ambiguity that prevents us from figuring out how to navigate is really a form of confusion; overload is one of many forms that “frustration in all that you do” takes. According to the Scriptures, good works are not simply the rare, special, extraordinary, or super spiritual things we do. Rather, they are anything we do in faith. Christians are to be the opposite of vandals and slackers in their work. We are to do work that will truly benefit people by going the extra mile rather than just doing the minimum necessary. Excellence in our work is actually a form of generosity and love, and poor quality is a form of stinginess and selfishness. Shoddy work is not just shoddy work; it’s a failure of love. I don’t believe our lives can be – or are supposed to be – fully “balanced.” I believe we are to seek to be centered, not balanced. If you plan in too much detail, your plans will fall apart and you will be frustrated. We simply don’t have enough knowledge or control to create highly detailed plans. Acknowledge this and submit to it, and you will get more done, not less. I’m not advocating unnecessary overwork or even prolonged periods of sacrificing family time. But the reality is that we too often have a pansy view of work.